Well, and a bit computery too, I am teaching myself how to photoshop at the moment, plus of course I have my work and my household-chores and everything. But I also like to walk and of course taking my camera with me, as I have taken up one of my old hobbies: photography. The picture I want to share with you, is one that made it from my camera to the interwebz without alterations whatsoever. I didn't even crop it, as the composition was okay with me to begin with. This picture is a detail of the local cathedral bell tower. The tower has six sides and a clock on each side. 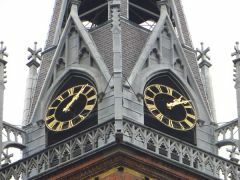 So, no matter from what direction you look at the tower, you always see at least two clocks. The tower is nicknamed "Drunk Man's Tower" because of that, even though it's official name is Jozefchurch. → So much to do, so little time!